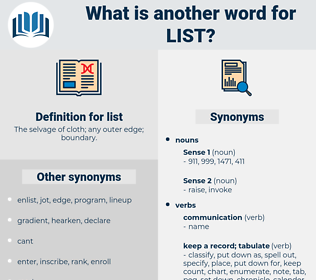 What is another word for list? The selvage of cloth; any outer edge; boundary. shortlist, enumeration, blacklist, playlist, checklist. Publications, Criteria, Fisheries, Copies, powers, spaces, Does. registers, inscriptions, titles, profiles, nominations, breakdowns, items, individuals, notices, coordinates, examples, rolls, ranks, sets, sponsors, Replies, Ones. Abbreviations, coordinates, data, Criteria, check-list, Enumerating, Registries, bibliography, poplist, selection, inclusion. Existed, included, Persisted, said, Remained, stated, thought, Indicated. identifying, highlighting, talking, Stating, going. selected, included, completed, prohibited, printed, poised, added, placed. suggests, highlights, reflects, states, regards, includes, Does. 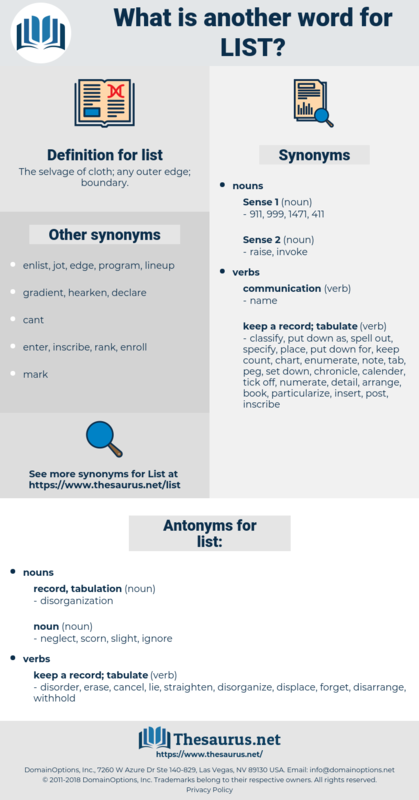 litany, wish-list, LISTSERV, roster, compilation, delisting, designation, ranking. disorder, erase, cancel, lie, straighten, disorganize, displace, forget, disarrange, withhold. Wallingford went on down the list in calm joy. Nor need the list stop here. lcd, licit, leucothoe, lac dye, laugh at, lusty, locket, lesotho, lost, lowest, lay aside, liquid, likuta, laxity, leased, lockout, loquacity, lygaeidae, locustidae, leg it, lighted, Lake Tahoe, lakeside, lose weight, liquidity, last, low-cut, liszt, last day, lee side, lash out, logwood, low-cost, locate, locusta, lygaeid, legate, lightwood, lacewood, located, lay waste to, legged, lucidity, lassitude, ligate, logic gate, log out, low-set, lucid, Lakota, liquidate, lookout, leak out, look at, last out, light, lock-gate, loquat, lightheaded, lychgate, lust, lsd, liked, luxate, light diet, leucocyte, lactaid, lowset, legato, listed, least, legatee, luck it, lawsuit, locust, luck out, light-headed, Lego set, look to, look out, lycosidae, loyalist, low-keyed, lake chad, lock out, liquid diet, locked, licked, Lactate, locoweed, leukocyte, laced, lose it, lucite, light-duty, lichgate, like a shot. FAQ, catalog, push-down stack, index, shopping list, black book, corrigenda, mailing list, sick list, roster, enumeration, bill, short list, bibliography, standing, record, numbering, credits, price list, play list, contents, class list, schedule, stack, canon, free list, blacklist, Honours List, grocery list, table of contents, wish list, push-down list, chart, criminal record, slate, playlist, masthead, calendar, queue, calorie chart, posting, hit list, order of business, checklist, roll, shitlist, agendum, shortlist, necrology, directory, computer menu, catalogue, distribution list, stock list, flag, ticket, character set, portfolio, codex, hit parade, key, menu, agenda, inventory, A-list. take stock, stock-take, inventory, index, blacklist, impanel, empanel, post.